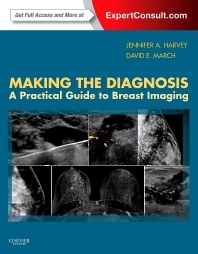 Detect and identify breast lesions at the earliest possible stage with Making the Diagnosis: A Practical Guide to Breast Imaging. Dr. Jennifer Harvey and Dr. David E. March utilize a practical, case-based approach to help you select and make optimal use of today's imaging options. Learn the right questions to ask when viewing a mammogram, MRI, or ultrasound. Zero in on the key information you need to know with highly templated, concise chapters followed by case studies that reinforce and expand your knowledge. Distinguish normal variants and lookalike lesions from cancer thanks to expert, highly visual guidance on all relevant imaging modalities. Interpret the findings you're likely to see in practice with the aid of high-quality images, enhanced with arrows and labels to help you recognize and identify suspicious lesions. Access the entire text and images online at www.expertconsult.com. 4. The Recalled Patient: Now What? 7. Management of Masses: BI-RADS 2, 3, or 4? "This book attempts to cover all aspects of breast imaging, with the inclusion of sections on postioning. technical quality and physics, as well as the interpretation of screening and symptomatic mammography...The book is well laid out, with each chapter offering the necessary information and a clearly presented summary of key points... This book would be a useful addition to any breast screening unit, offering a helpful resource to trainee specialist radiologists and advanced practitioner radiographer...I would recommend this textbook as a useful resource for a wide audience."